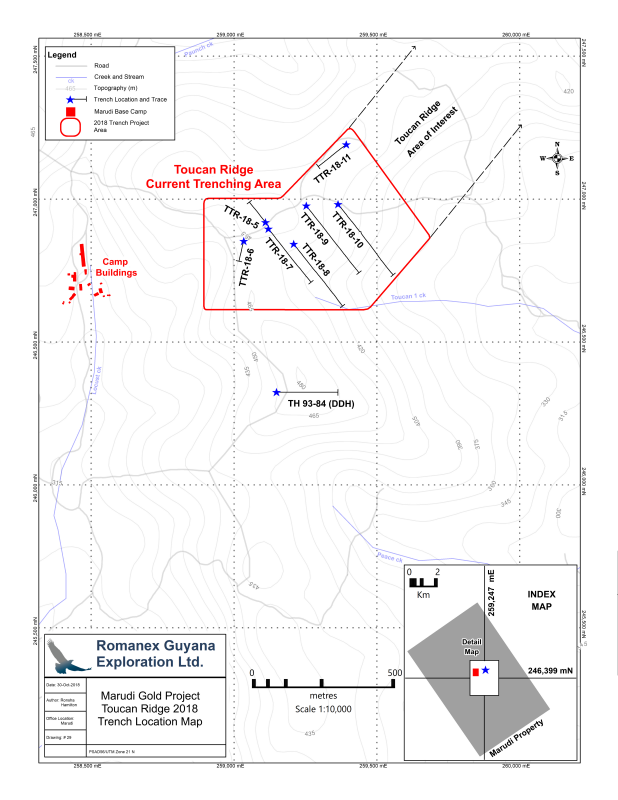 October 31, 2018 / TheNewswire / Vancouver, Canada - Guyana Goldstrike Inc. (the "Company" or "Guyana Goldstrike") (TSXV: GYA, OTC: GYNAF, FSE:1ZT) is pleased to report sampling and mapping of trench TTR-18-12 has commenced at the Toucan Ridge area on its Marudi Gold Project ("Marudi" or the "Property") located in the Guiana Gold Belt, Guyana, South America. TTR-18-12 is oriented to cross an outcrop of quartzite-metachert that has been exposed and is situated 40 m southeast from and parallel to TTR-18-11. Trenching at Toucan Ridge began on the western end with trench TTR-18-06 located approximately one kilometre east of the Marudi North zone and one kilomtetre north of the Mazoa Hill zone. Please see "Toucan Ridge Location Map" below for trench locations. A total of 1748 metres of trenching has been completed in the Toucan Ridge area to the end of TTR-18-11. 518 samples have been taken. The exploration team will continue to trench along the ridge progressing in an eastward direction. The area of interest continues for more than 1.75 kilometres to the east of trench TTR-18-06. Trench sites are planned where quartzite-metachert is exposed or interpreted to occur beneath the transported overburden. The eastern part of Toucan Ridge is approximately 400 metres south of the Paunch area which was trenched in May and returned the Company's first significant gold discovery. The Company also announces that it has, subject to regulatory approval, engaged Venture Liquidity Providers Inc. ("VLP") to provide market-making services and to assist in maintaining an orderly trading market for the common shares of the Company. The market-making services will be undertaken by VLP through a registered broker, W.D. Latimer Co. Limited, in compliance with the guidelines of the TSX Venture Exchange. For its services, the Company has agreed to pay VLP a monthly fee of $5,000 for an initial twelve-month term. In addition to the monthly fee, VLP will also be granted 100,000 incentive stock options of the Company. The options will vest in four equal tranches over a twelve-month period and will be exercisable at a price of $0.30 for a period of 60 months. The Company and VLP are at arms'-length.